Buffalo, NY Native, Seth's life was irrevocably changed after witnessing a mind-blowing Groundlings show in LA. Since then he has actively pursued his love for making people laugh with (but mostly at) him in our nations capital! When he’s not traveling the world internationally broadcasting, slinging tasty Za in Virginia, or pouring delicious beers at a brewery in DC, you can find Seth performing comedy like madman. 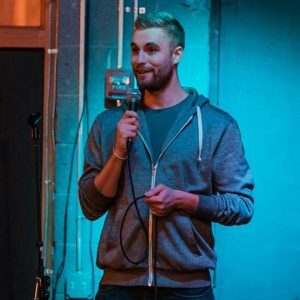 He’s currently on the indie improv teams BEST PARTY EVER and Pizza Party, produces a monthly stand-up show for improvisers called Schtick, hosts the “Comedic Pursuits Podcast,” and is involved in numerous other comedy projects around town. In his rare time off he enjoys concerts, morning raves, craft beer, and petting dogs that he does not own. Volunteering is a fantastic way to fully understand all the elements that help make a WIT production, and it’s also a great way to meet other passionate performers in the community. When he’s not traveling the world internationally broadcasting, slinging tasty Za in Arlington, or pouring delicious beers at a brewery in DC, you can find Seth performing comedy like madman. He’s currently on the indie improv teams BEST PARTY EVER, Pizza Party, and Mindmap, hosts a monthly stand-up show for improvisers called Schtick, produces his own podcast “Funny Stuff Isn’t Taken,” and is involved in numerous other comedy projects around town. In his rare time off he enjoys concerts, morning raves, craft beer, and petting dogs that he does not own.